Tomaz Pelayo was born in Norte Street, in Santo Tirso, on 20 May 1898. His parents, Pelayo Júlio Gonçalves and Maria da Conceição Moreira, baptized him six days later at the Parish church. The ceremony was presided by Father and Archaeologist Joaquim Augusto da Fonseca Pedrosa. From a very young age, Tomaz Pelayo showed that he enjoyed painting. On 19 August 1912, he sat his 2nd year primary education exams. In 1919, he was sent to the School of Fine Arts in Porto, with the support of Monsignor Gonçalves da Costa, the parish priest of Santo Tirso. He enrolled in the first year of the Preparatory Course, which he completed in 1923. Later, on 4 October of that same year, he was admitted to the Special Painting Course, which he completed in 1923, and obtained the final mark of Good. Between 1925 and 1932, he stayed in Paris quite regularly, where he was taught by the masters who lectured at the schools of A. Laurene and E. Renard. In April 1927, he was admitted to the Salon de Paris. The following year, he exhibited about sixty paintins inspired on Portuguese and French motifs, at the Levieli Gallery (from 16 to 30 November). 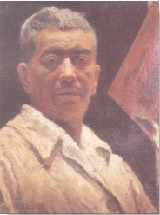 In 1930, he was once again admitted to the Salon, and took part in the exhibition with a self-portrait. In that same year, in April, he showcased twenty five paintings in the atrium of the Misericórdia of Porto. He lectured in various secondary schools in the country: Infante D. Henrique Industrial School, in Porto, from 1923 to 1924; Madeira Pinto Industrial and Commercial School, in Águeda, in 1933; Marquês do Pombal Industrial School, in Lisbon, from 1933 to 1937; Industrial and Commercial School, in Braga, between 1937 and 1945; between 1946 and 1950, he stopped teaching and dedicated his time to painting. In 1950, he taught again at the Carlos Amarante Industrial and Commercial School, in Braga, where he remained until 1957. Meantime, in 1933 he applied for the Painting position at the School of Fine Arts in Porto, but lost the position to Dordio Gomes. Tomaz Pelayo organized an exhibition with José Cavadas, in August 1940, at the Tourism Bureau, which was then located on the ground floor of the Cidnay Hotel, in Santo Tirso, and, in 1945, he exhibited his work in Fátima. He was also present in exhibitions in Lisbon and Coimbra, and received an award from the Society for Fine Arts in Lisbon. He lived in Santo Tirso from 1957 until his death, where he worked at the Industrial and Commercial School, and continued to paint and socialize with friends, for example, artist Eduardo Malta. In July 1988, a retrospective exhibition of his work was organized at the Tomaz Pelayo Secondary School. The painter died on 15 January 1968, at the age of sixty-nine.